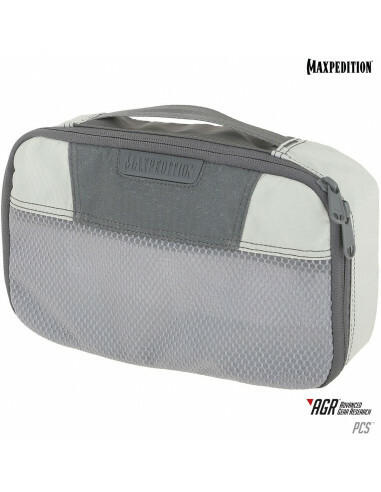 The PCS Packing Cube (Small) is a soft container excellent for travel accessories. The packing cube has been designed to be used with larger AGR bags and packs, such as the IRONCLOUD™ and IRONSTORM™. Its fabric is color coordinated to match the grayscale interior lining of other AGR products. The lightweight, collapsible nesting design allows for easy storage of multiple packing cubes inside a suitcase or luggage. The main compartment has a two-way zippered opening and an interior Gossamer™ mesh zipper pocket for further organization of contents. The packing cube can be used to hold items such as undergarments, socks, belts, and ties. Overall size: 10.5 (L) x 3 (W) x 6.5 (H) in | 26.7 x 7.6 x 16.5 cm - Weight: 4.1 oz.